Derry manager Damian McErlain knows what’s at stake and isn’t preparing any excuses as Derry try to plot a promotion path out of Division Four. Have to deal with it. McErlain’s mantra couldn’t be clearer; ‘We’ve got ourselves into this - it’s up to us to get ourselves out’. There will be no plaudits handed out if his target is achieved. It’s not exactly ‘no win’ territory for the Oak Leafers but it’s close and Derry are the scalp every other bottom tier county is looking to use as a springboard for their own aspirations. That’s why McErlain believes focus is so important. Start believing the bookies’ odds and things could go pear shaped quickly. 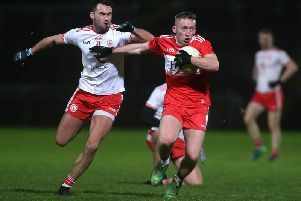 The recent McKenna Cup performance against Tyrone, albeit in defeat, merely underlined the Oak Leafers’ status as promotion favourites but that tag is coated with dangers, especially for a county facing the rebuilding job Derry are. 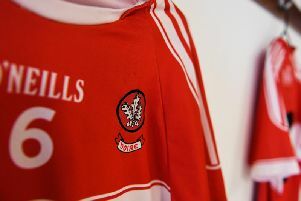 “That’s just something we have to deal with,” shrugs McErlain when Derry pre-season billing is put to him, “We have got ourselves into this situation so we have to go out each match and do what we need to. “We couldn’t have a bigger match than Antrim away for the first game. Antrim are a good side, well coached, well drilled and we have been watching them closely this last few weeks. It couldn’t be any tougher for us going there. Division Four is a division of miles, lots of miles. In that regard, Derry’s road to redemption begins with a gentle introduction in terms of Corrigan Park though McErlain is at pains to point out that his travel plans will be the only thing gentle about Sunday’s league opener. “Somebody has to been seen as favourites and we are the scalp in the Division but again, that’s why it’s so much about ourselves and getting our own game right. “We have to get our commitment levels up and have a squad competing with each other so you have the depth to cope with whatever comes at you whether it be injuries or form etc. “Antrim are a quality side with a lot of players we would be familiar with us being neighbouring counties,” adds the Derry manager. And they should be. Whatever pessimism was lingering from last season’s disappointing relegation was taken care of by some positive performances in the McKenna Cup, the reintroduction of the Slaughtneil contingent and the successful integration of younger players who have breathed new life into the panel. Antrim are in a similar position to Derry in that they face a rebuilding job. The Saffrons are well used to the rigours of the league’s bottom tier. They know how precarious it can be. The McKenna Cup was experimental for Antrim. They impressed in victory over St. Mary’s but only after defeats to St Monaghan and Armagh. They have retained experienced players like Ryan Murray, Paddy McBride and Niall Delargy who will be expected to carry the bulk of the Saffron attacking threat this weekend. Not for the first time in recent years, the powers that be have dealt them a tough hand in terms of home and away fixtures with four of their seven fixtures on the road which could prove pivotal to their own aspirations. It also means Harbinson will be stressing the need to maximise the return from their three home games, starting this Sunday. With a trip to Wexford, the second team relegated from Division three last season to follow, Antrim’s promotion hopes could hinge on their opening two games so they need a big start. Damian McErlain will know all this. So too, his Derry players. This is going to be a battle. “Everybody is going for it,” adds McErlain, “Antrim will be gunning for promotion, Wexford are very strong, there are some very tough places to go in Division Four. There are some good footballing sides with good structures behind them. The McKenna Cup has been good for Derry this year but the season starts on Sunday.